If the DME has detected knock sensor readings (from running on 95 ron) and there for adapted itself to run retarded, how long does it take to revert back to the standard 98 ron map once if doesn't detect any pinking? I've read in the past it takes a couple of fill ups of 98 ron, but does anyone have a more specific time frame? The DME can "learn" the fuel grade (and atmospheric fuelling effects), so if you are planning on using a higher grade than in the last tankful, do a reset for immediate effect (rather than waiting for up to half a tank to passive reset). Reset via key requires turning the key to ignition "1" (the position when all the lights are on on the dash) and leaving it for 60+ secs (DO NOT TOUCH THE THROTTLE PEDAL), then switch off for 10+ secs and you should be able to hear a few clicks and whirs from the engine bay as it recalibrates the adaption values. Extract from a GT4 post on an historic multi page fuel thread. I thought that was only relevant for the Bosch DME that was released on the 3.6 996 and newer (according to Adrian what's his face guide). Apparently once pinking is not detected the DME gradually returns the ignition timing back to its optimum. Doesn't say over how many miles though. Yep, forgetting you have the earlier model. Whilst digging around I saw mention a couple of times that all that was required was half a tank for recalibration, but couldn't swear that it was the 996.1 being referred to. ......and I've been no help at all. I'm with infrasilver with this - the knock sensor is part of the engine management system and therefore not 'learned' or adjusted over time. Put it another way, if it took 'tankfulls' for the DME to adjust, putting inferior fuel in would lead to knocking for a tankful or so, and I have not experienced this. On trips through Europe it is often difficult to get 98ron fuel, so when I put in 95 E10, there is no knocking detected at all - though I do notice that the car runs at a slightly higher temperature. So I think adjustment is immediate and continuous. Knock sensing is pretty much instant .. image is probably better than me trying to explain it though .. There are no long term ignition trim tables. 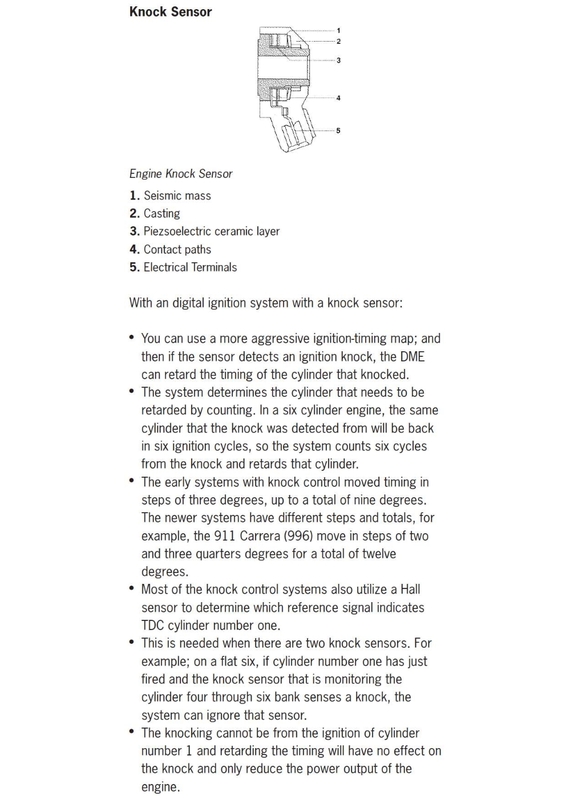 Essentially, the knock is live monitored with a feedback loop that retards the ignition if knock is detected, then the ignition is progressively advanced over a set number of ignition events until knock is detected again, and so on.. I can't remember last time I put 95 in. Reason I was asking is cos my bank 1 solenoid was sometimes stuck with the cams advanced causing lumpy tickover and no doubt a loss in low end torque. My mechanic reckoned this would cause the engine to pink when advanced at low revs.......resulting then in the potential for the DME to think it was running on 95 ron and adapt to it. So I was then wondering how, what and when the DME would adapt. With your particular fault then the car would adapt as best as it could with knock and lambda sensors being the main ones .. It will constantly try to adjust the timing on each cylinder to keep it at optimum and it will use the lambda sensors to maintain the correct fuel to air ratio .. the car can only do so much though so a lumpy tick over is the end result . With newer model cars they have more sensors which are faster and the cars adapt pretty dam well to a fault .. not uncommon for me to see a car that runs and drives perfectly but has at least 1 failed sensor on it or indeed an air leak . That's amazing stuff! Glad I asked the question now. You also have short term and long term fuel adaptions . Long term .. say a small vacuum pipe was leaking .. the car would continually see this on the lambda sensors and would slowly adjust the fueling to compensate for this .. as the leak got worse it would continually adapt to this ... upto a point .. the car can only do so much , when outside limits then it flags a fault code . long term is for wear and tear basically . This is done at lidle ... we call this Rkat and most times there is a problem then the long term adjustments recorded in this give us an indication of a fault ... from the readings its either running rich or lean . Mid rev range and its Frao . High rev range and its Frau .. i think i have got these two the correct way around . Basically you never really see much adaption in these ranges..
Short term fueling adjustment is mainly on more modern cars ..
Say someone left the oil cap loose .. thats a big change to the mixture in a short space of time so the car rapidly adjusts for this and its a live reading so i can see if the car is running rich or lean straight away ... but its 997 onwards really im afraid . The car compensates by increaseing or decreasing the injector duration .. it gives each cyl more or less fuel based on the above . knock sensor and it adjusts the timing which can also be used for the above .. anything that gives correct lambda is basically the key . Its also very good for the save the planet stuff .. slightly out of lambda signifcantly increases the output of NOx and thats bad for the planet . My short term fuel trims were up and down like a brides nightie. Bank 1 was constantly trying to compensate something not being right and always in minus figures whilst bank 2 in positive. Now the solenoid has been done they're nice and balanced. Yup .. the issue you had was difficult for the car to compensate for .. intermitant faults are always the worst .. for us and the car ! You could already see the problem was on bank 1 though .. thats usefull when diagnoseing .. you then think , what could effect an entire bank ? Theres not much and valve timing is pretty much it in a normal world so thats the area you work on . As the cars have evolved then the adaptions to faults .. the fault codes etc have become far better ..
An example ive mentioned before ..
996 .. high lift tappet fault .. not your car .. no fault code. 997 .. high lift tappet fault .. fault code for a single bank of misfires and sometimes lambda sensors swopped . 991 .. high lift tappet fault .. fault code for this but it doesnt know which bank .. The cars get better all the time , wont be long before the car tells me what to replace ! Will happen, but you can't beat old school knowledge. I remember my mate (who I class as the world's best mechanic - he even won an award off Jaguar for it) telling me a story about a local rally driver rocking up at the boozer in his 6R4. My mate was there on the back of his mates Suzuki 550 or something similar. When the rally driver was leaving the pub he couldn't start his 6R4. Some hot start problem. Anyway my mate takes one look and says - you're running too lean mate. Rally driver looks at him as if to say - who the f*** are you. My mate goes over to him and asks if he has a hanky, by which rally driver produces one out his pocket. He then goes over to the 550, takes the fueal cap off and soaks the hanky in the tank. Pops the boot on the 6R4, holds the hanky over the air intake and says - right, fire it up. Boom - the 6R4 bangs into action. Thats it in a nut shell ..
Porsche train their guys to work with the fault code .. follow the test plan .. my argument was what if there is no fault code ? That was ignored .. the latest cars do tend to give a code to be fair so we have something to work from .. but Porsche still want robots .. I will say that the English market gives them the most headaches .. they dont like us very much lol . The end result for guys like me .. we will print a log of the car control units .. Porsche will evaluate that log then tell us what to replace ..
OPC will end up a bunch of fitters doing what Porsche tells them to do ..
Thats is the future Gentleman .. glad ill be long gone when that finally happens . It is pretty instant when you put in 95 to make the change although it does that when you go WOT as cruising along makes no real difference. Clearly if you fill up half a tank later with 98 and have half a tank of 95 then you have a blend of 96.5 so think about this as it cannot return to optimal level until you get back up to 98. The ecu makes compensation tables ( adaptions ) so it needs to move from them to the normal tables. So if you had a full tank of 95 and then fill up with 98, 20 minutes of spirited driving with some third gear WOT runs and you will be back at full power. As the ECU becomes later edition the time reduces but you need WOT runs to get it to re adapt. I see this a lot when tuning - sometimes people have 97 in the car so if I see knock first port is always to fill up with vpower and make sure if the cause is fuel - you can literally watch it change on the screen. Another very interesting post in this thread. Just be careful if you chose to do it on your forehead and using a mirror.